1.5 Which Is The Best Grinder For Me? As technology develops, we get new products. In some instances the products aren’t even new. We just have new features on existing products. Coffee grinders is one where it has been around for many, many centuries; technology has just added features to it that not only makes them more efficient at what they do, but also more effective in the way they do it. Ethiopians, back in around 800 A.D. had been grinding coffee beans, back then they were used as meals rather than drinks. They enjoyed coffee none the less! Back then the grinder was more of a pestle & mortar setup. There are various different types of coffee grinders available on the market today. The sheer volume of them almost makes the task of shopping for one daunting. The reason Best Coffee Grinders UK was created is for a means for us to help you find the best grinder for your needs. 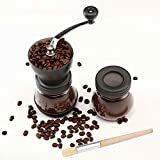 Whether its espresso or just a barista style coffee you’re after, this site aims to provide you with all the information you need to buy the best grinder for your needs. Blade grinders are cheaper than burr grinders. They are a good option for your first grinder. If you aren’t sure whether to invest in one or not, then blade grinders provide that go-between. The process in which they grind the coffee is extremely different in that the burr grinder has some models which have conical plates and others have flat plates. The two burrs sit an equal distance from one another, whether flat or conical. This gives us the equal consistency that we expect and look for in a coffee grinder. Most burr grinders will have different settings as to how fine you want your coffee. You can have it ground fine for an espresso or have it course if you fancy a French press. When shopping for a burr grinder you want to make sure the RPM or speed is relatively low. The higher the speed, the more likely it is to burn the coffee – it will essentially be re-roasting the coffee. With most burr grinders, you can set a timer or tell it how many cups of coffee you want and it will do it for you. It is a set it and forget it grinder, you don’t have to keep an eye on it like you do the blade grinder. 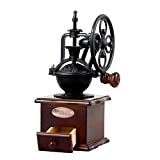 The last type of popular grinder is the coffee mill, otherwise known as the hand grinder or manual grinder. It is just what it sounds like, you put the coffee inside and grind the coffee by hand as you turn the handle. In terms of aesthetics, depending on which one you go for, they do tend to look very classy. They look like something from a 1960’s movie, they have a certain charm to them. Hand grinders are a happy mix between the blade grinder and the burr grinder. You can get the consistency you desire (depending on the model) as you are grinding it by hand. It will be close to what you want but no where as consistent as the burr grinder. If you are looking for the ultimate in control over the consistency of your coffee granules, then the hand grinder will do this for you because as you turn the mill, you can actually see your coffee and how fine you are grinding it. Hand grinders also require an effort on your part. So if you have woken up and are waiting for that pep or buzz to get you going from you coffee, you need to muster up some of that pep in order to get the coffee going. I find these more of a nice to have, than a requirement as far as grinders go. Perfect when you want to show off to other coffee lovers about the cool coffee stuff you own! Which Is The Best Grinder For Me? Price can be the first factor to consider when looking at coffee grinders and if it is for you, then you may want to venture towards the blade grinders. They are cheap enough to get the job done. The job done will not be a bad job at that. They provide a good gateway utensil into the world of coffee grinders without you having to make such a large investment. You could also opt for a mill grinder because they are also on the cheap end, but beware; the fact that you have to manually grind your coffee by hand could be enough to put you off grinders altogether. How Much Will I Use The Grinder? Like the previous question, the answer to this will dictate which grinder you should choose. If you are a 3-times-a-day espresso or a French press drinker then you will most definitely want to go with a burr grinder, without a doubt. 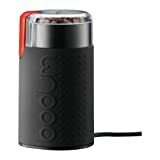 It is the only grinder that will give you a consistent texture from your bean. If you are one of those people who usually grabs a Costa or a Starbucks on the way to work during the weekday and has a few cups of coffee on the weekend then I would lean towards the blade grinder. It is a cheaper investment and for a utensil that will sit there idle more than it will be in use, it is the best way forward. Having said that, if it is an espresso that you enjoy on the weekends, then you will not get this from the blade grinder and I would consider the slightly higher price on the burr grinder. If you are looking to be a frequent user of your grinder then you will also need to clean them regularly. Find a grinder which is easy to disassemble so you can reach into the inner workings of the grinder to give it a good clean.